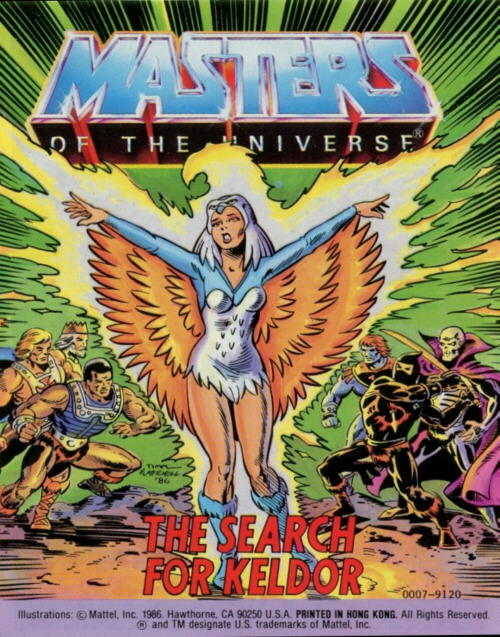 The Search for Keldor is a 1986 Masters of the Universe mini-comic written by Steven Grant and illustrated by Bruce Timm and Steve Mitchell. Here, Randor seeks to discover the fate of his long-lost brother. So this is the comic that implies, not at all subtlety, that Skeletor is Randor’s brother (and He-Man’s uncle). And while this is clearly a relatively sudden decision by Mattel, it can be made to fit reasonably well with Skeletor’s extra-dimensional origins in Halperin’s series bible. 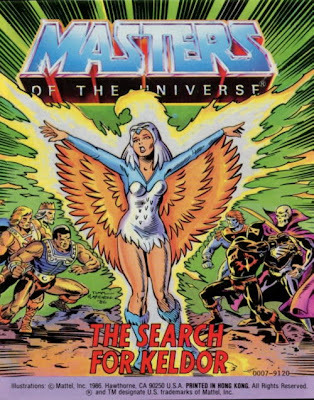 Beyond the Darth Vader-style shock value, though, this revelation isn’t of particular value to the 1980s line, as it wasn’t ever mentioned again, although the 200X series explicitly adopted the Keldor-as-Skeletor story element, if not the Keldor-as-Randor’s-brother one (at least, not his full brother, certainly). Beyond the introduction of this story element, this isn’t a particularly well-written comic, and the obligatory toy plugs aren’t the only thing that hold it back. Skeletor summons some easily-subdued, decidedly second-string minions out of the blue, and then is surprised when they can’t get the job done (he asks for the most evil beings of all time – maybe he should have asked for the most competent). Faker is here, and one wonders yet again (much as Randor does) why we have to bother with the pretense that this different-colored, differently-clad creature is impersonating He-Man. And on the last page, it’s He-Man, not Prince Adam, telling the king, “Don’t worry, Father…” and making it clear that he knows all about what’s going on even though he just showed up. How did that get past the editor? About the only other positive thing going on here is the further development of Randor as a noble and self-sacrificing man of action. The art is pretty good, much as we expect any time we see Timm’s name in the credits. In addition to the usual strengths, the use of color and heavy inks do a lot toward establishing a suitable nighttime atmosphere. This isn’t a great comic, but because of its contribution to the mythos, it’s a must-read.